The Saudi Arabia air force has bombed a market in Yemen killing 70 civilians, rebels in the north of the country say. The rebels, known as Houthis, have been fighting Saudi and Yemeni forces since August this year and accuse the Saudis of frequent attacks across the border. Bani Maan, the village hit by the air raid is in the border region between Saudi Arabia and Yemen. The Yemeni army has reportedly claimed it carried out the attack, not Saudi Arabian forces. A spokesman for the Yemen's army, Askar Zuail, told Agence France Presse that the Saudis were not involved. "Bani Maan is one of the most fortified rebel strongholds. 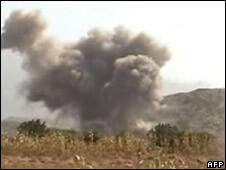 Today Yemeni aircraft launched a number of air raids, killing many Houthis," he said. "Saudi aircraft committed a massacre against the innocent residents of Bani Maan," a statement on a Houthi website said. The Houthis accuse Saudi Arabia of supporting the Yemeni government in its campaign against them. In November the rebels launched a cross-border raid on a Saudi mountain region, which they held for several days before being pushed back by Saudi troops. There have been several skirmishes around the border, but the Saudi military denies it has carried out attacks inside Yemen. The Houthis, named after the family of their leader, say they are trying to reverse the political, economic and religious marginalisation of the Zaydi Shia community in Yemen. The Zaydi community are a minority in Yemen, but make up the majority in the north of the country. The insurgents have been fighting the government since 2004. The government launched a fresh offensive in August 2009, which precipitated a new wave of intense fighting. It accuses the Houthis of wanting to re-establish Zaydi clerical rule, which ended in 1962. Aid agencies say tens of thousands of people have been displaced.